Overview This is a 4-pole low pass filter based around a cascade of integrators. 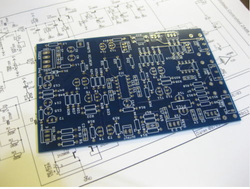 It is temperature compensated and it appeared in later ARP 2600 models. Its cutoff range was severely limited to just 12kHz by a design error, which can be easily corrected. This is an excellent filter, with a clean low distortion ouput that will oscillate at higher resonance settings. Original Circuit The original design uses 2N5087 matched and thermally coupled transistor pairs, as well as the LM3900 Norton amplifier chip. Both of these components are still available. ARP sensibly ditched the old LM301 Op Amp used in previous filters, and replaced it with a LM1458. AM Circuit The cloned circuit is exactly the same as the original, as all the components are easy to locate. The AM module contains the original ARP module circuit as well as the additional circuitry of CV and signal summing which is held on the main ARP PCB's. This provides a self contained module for use within any modular system, rather than a replacement module for ARP synths. Hand matched transistor pairs have been used, rather than expensive pre-matched transistor pairs (e.g. SSM2210). However the filter works perfectly well without hand matching the transistors. The CV summing Op Amp is a high quality (low offset) OP177 rather than the original LM1458. All capacitors have been upgraded as well; 1% polystyrene capacitors are used in the main filter core, WIMA and Pansonic Audio capacitors in the audio signal paths and Pansonic FC capacitors in the power supply. The trimmers are all cermet 20 turn. These upgrades pay off, the filter sounds fantastic! The Tempco resistor can be omitted (and a standard metal film resistor used) if you are not concerned about the filter oscillation tracking properly. We have had 1K87 3500ppm tempco resistors specially manufactured, and we recommend fitting one of them. The frequency control circuitry of the original has been expanded to include a dedicated keyboard CV input, as well as a FINE front panel control and an internal frequency trimmer for setting up the filters response.